This is Modi's first visit after the Centre announced suspension of operations against terror groups during the holy month of Ramzan. LEH: Prime Minister Narendra Modi started his day-long visit to Jammu and Kashmir by kickstarting Asia's longest Zojila Tunnel, part of Rs 25,000 crore projects to be unveiled or dedicated to the nation today, saying it showed New Delhi's committment to all-round development of the state. Addressing a large congregation gathered in Leh ground for the closing ceremony for birth centenary celebration of the 19th Kushok Bakula Rinpoche, the prime minister said the tunnel would help in connecting the region with the rest of the country, a dream of the Buddhist spiritual guru. The prime minister also announced the creation of a virtual museum which would showcase the history and tradition of Ladakh region to the world. 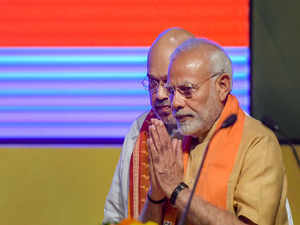 Modi arrived here this morning on a day-long visit to the state, his first after the Centre announced suspension of operations against terror groups during the holy month of Ramzan. Accompanied by Road and Transport Minister Nitin Gadkari and Minister of State in the PMO Jitendra Singh, Chief Minister Mehbooba Mufti, Modi paid tributes to Kushok Bakula Rinpoche at the clos ing ceremony and unveiled his plaque. He began his speech in local language which was greeted by applause by a large crowd which had come to attend the function. Paying rich tributes to Bakul Rimpoche, he said, "We remember the rich contribution of the 19th Kushok Bakula Rinpoche. His was a life dedicated to serving others." Unveiling a plaque for commencing the work for the tunnel, Modi said, "Zojila tunnel is not a mere tunnel but a modern day marvel." He said the cabon dioxide would be removed from the tunnel through a tower, seven times higher than the Qutub Minar. Modi said it would provide connectivity to the region besides employment to the local youths. "Jammu and Kashmir is going to get development projects worth Rs 25,000 crore. These projects will have a positive impact on the people of the state," he said. He said the Centre and the state were working towards the development of the state. "Today p rojects worth Rs 25,000 crore will either be dedicated to the nation or the foundation stone will be laid. This shows that New Delhi is completely dedicated to all-round development of state," he said. Taking a dig at the Congress he said when he took over as the prime minister, thousands of villages were without any electricity. "My government took electricfication process of mission mode and took out these villages from the era of darkness," he said. He said nearly four crore houses, which did not have electricity even after 70 years of Independence, would be given connection within a year and a half. "19th Kushok Bakula Rinpoche distinguished himself as an outstanding diplomat. During my Mongolia visit I wi tnessed the goodwill he has in that country," he said. A scholar of the Mahayana school of Buddhism, he was head priest of the Spituk Gompa. He died in 2003. Bakula Rinpoche served the state and nation as he was elected as the member of legislative assembly of Jammu and Kashmir in 1951. He became a minister in the then state government. In 1989, he was appointed as India's ambassador to Mongolia which made him the first and only Monk diplomat in the world. This is prime minister's second visit to Leh, a Himalayan town sharing border with Pakistan and China and located 450 kms north of the summer capital city of Srinagar. He visited here on August 12, 2014 and inaugurated a hydel power project. The prime minister, while unveiling plaque for commencement of work for Zojila tunnel, said the project aims at construction of 14.15 kilometer long two lane bi-directional single tube tunnel. The construction of this tunnel will provide all-weather connectivity between Srinagar, Kargil and Leh and would lead to all-round economic and socio-cultural integration of these regions, he said. The tunnel would cut down the 3.5 hours of drive through the mountainous Zojila to 15 minutes. Gadakri, in his address, said 90 per cent of employment would be provided to local youths in the construction of the tunnel. He said that it would help the armed forces for round-the-clock supplies. Welcoming the prime minister, Mufti thanked the prime minister for participating in the closing ceremony of Kushak Bakula. The chief minister said the Zojila tunnel would be instrumental in increasing tourism traffic to Ladakh region. About the Zojila tunnel, she recalled that Gadkari had given a time of seven years for completion of the tunnel but the prime minister asked him to ensure that it be completed in next five years. "I'm confident that it will be completed during your tenure as prime minister," she said.